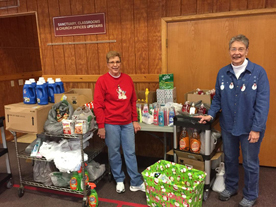 The Unionville Food Pantry was started by Nancy Liston and Alice Ketterer when they saw a need in the community to serve people who didn't fit the requirements for federal assistance. The Unionville Food Pantry is a community food pantry, located at the Unionville Methodist Church 1297 Route 68, Rochester, PA 15074 (New Sewickley Township), and run by Compassionate Ministries of the church. 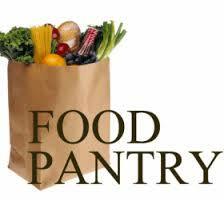 The pantry is supported by local churches, organizations and Freedom Schools. 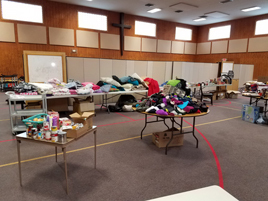 The food pantry is a community effort to feed and clothe those in need in New Sewickley Twp., Freedom, Rochester, and New Brighton areas. If you know of someone that needs help, or if you or your organization wishes to donate food or clothing to the pantry please call the Unionville Methodist Church at 724-843-0862, or Jo Shane at 724-846-5146. The Pantry has been very busy in 2017. Average monthly participation throughout the year runs between forty and fifty families. 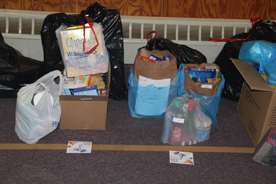 In November 90 families were supplied with groceries for Thanksgiving. 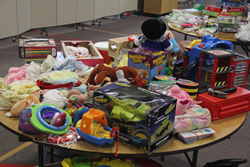 Christmas groceries totaled 89 families with gifts of clothing and toys for 98 children. Through the generous donations of individuals and groups the Pantry is restocked and ready for the New Year. None of this work would be accomplished without the countless hours from volunteers who sort clothes, shop for groceries, stock shelves, bag groceries and most of all listen to the participants and their needs. We have been blessed and we hope that you will be also. Once again we thank the folks at the Big Knob Grange and Baxter Auctioneers LLC for their donations to the Unionville Food and Clothing Pantry. 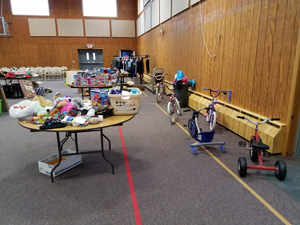 Donations this year were received from those who attended the 2017 Big Knob Fair in August, and auctions by Baxter Auctioneers LLC held monthly at the Grange and Monaca. 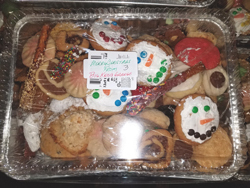 The ladies of the grange baked and packaged cookies for all the families served by the pantry at Christmas. Just a small portion of the this years donations are pictured below. 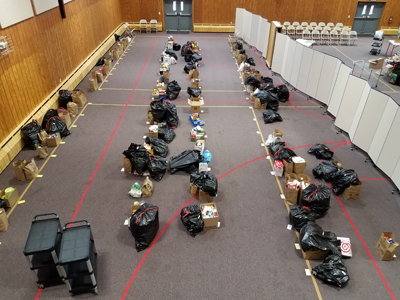 Oak Grove Lutheran Church and Unionville United Methodist Church provided groceries for the Thanksgiving Harvest Homes and helped fill the boxes. There were 63 families served for Thanksgiving. Lighthouse Lutheran church provided a car load of groceries and six turkeys. Mary Lou Steinbach also provided six turkeys for distribution. Gift cards were also provided by several individuals. The Christmas distribution served 66 families and 73 children. 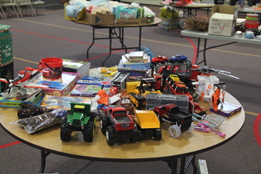 The children each received toys and and clothes as well as a tooth brush, tooth paste, soap, shampoo and conditioner. The older children also received deodorant. 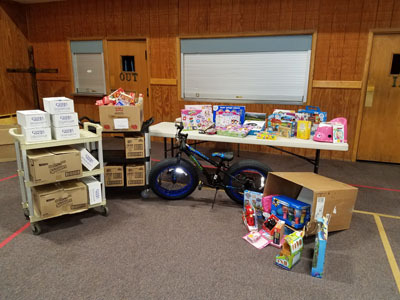 Gifts were provided by Unionville UMC and Oak Grove Lutheran Church and the Christmas ditty bags were provided by Missy and John Vodenecker. The Big Knob Grange provided cookies for the all the families. Freedom High School delivered groceries and grocery bags filled with snacks for the kids. Once again Saint John's Evangelical Church (Burry's) provided filled book bags for school age children. Cub Scout Pack 444 delivered donations for the pantry after Christmas to help start 2017 off in a positive manner. Thank you Pack 444 and parents. Lynn Goehring from Oak Grove Lutheran Church received a Two Hundred Fifty Dollar grant from Trevent Financial to purchase detergent, dish soap, cleaning supplies, shampoo, soft hand soap and condiments for the pantry. What a blessing.